Much of the contiguous United States just experienced one of the warmest winters on record, with the Southwest and the eastern half of the nation leading the way. 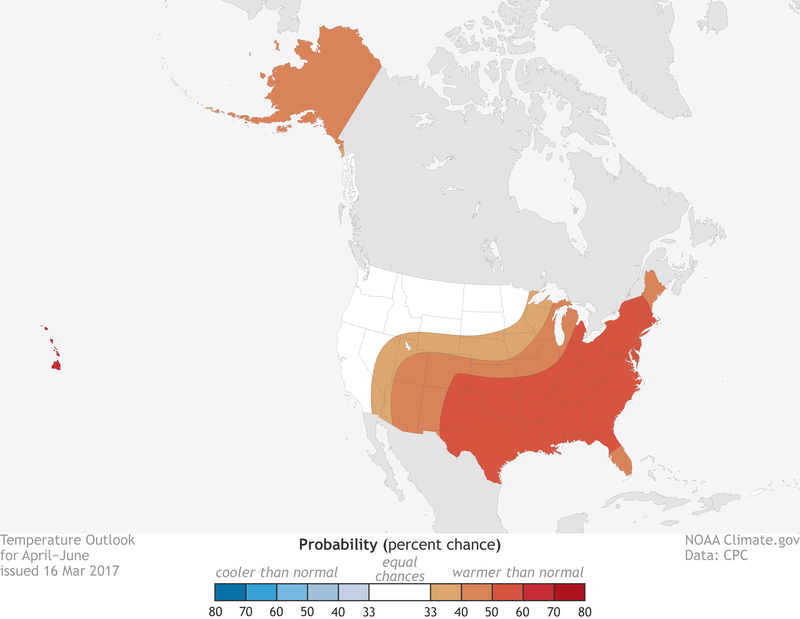 According to NOAA’s Climate Prediction Center, the April–June temperature outlook suggests this pattern of warmth will continue. Above-average temperatures are favored for a large area stretching from the Southwest eastward to include the Central and Southern Plains, Great Lakes, Southeast, and Northeast. Most of Alaska and Hawaii are also favored to see above-average temperatures. Winter also brought above normal precipitation to much of the contiguous United States and abundant snowfall to several regions. Overall, it was the wettest winter since 1998 for the Lower 48. Whether this pattern will continue for much of the country remains to be seen. However, the Climate Prediction Center’s April–June precipitation outlook favors wetter-than-average conditions for the northern Rockies, Northern Plains, and along the Gulf Coast from Texas to the western Florida Panhandle. 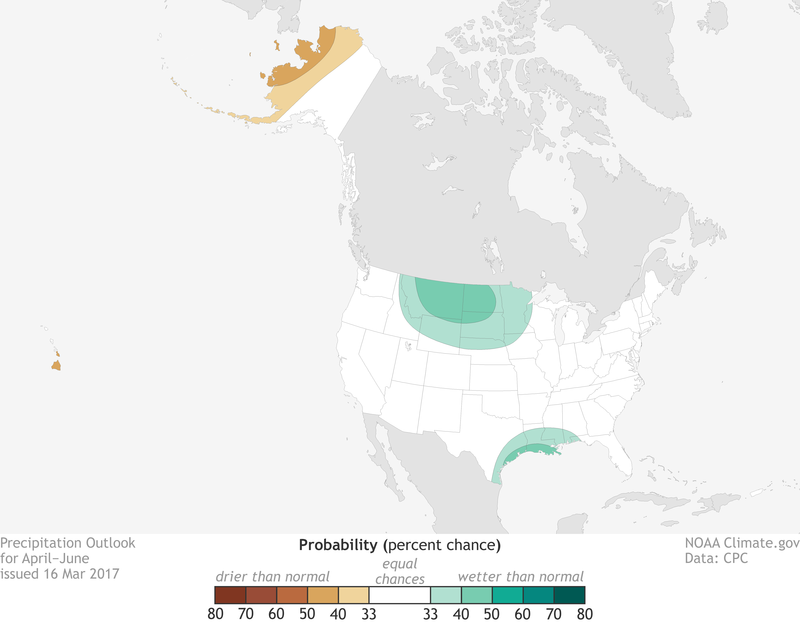 Below-average precipitation is favored for the western half of Alaska and eastern Hawaii in the spring. NOAA’s Regional Climate Services Directors lead the production of these quarterly summaries of climate impacts and outlooks for various regions of the United States as well as parts of Canada along the border. This effort, which began in 2012, now includes as many as 10 unique regional products, all produced collaboratively with partner organizations. Since June 2016, NOAA’s Regional Climate Services Director for Alaska has been working with our Canadian collaborators from the Environment and Climate Change Canada Northwest Provinces to create a seamless joint summary for this region. Similarly, NOAA’s Regional Climate Services Director for the Eastern Region has also worked with Environment and Climate Change Canada to create a seamless assessment for the Gulf of Maine region. Our partnership with Canada helps us provide the tailored information these communities need to better understand their unique regional climates. You can access all of the Climate Impacts and Outlooks summaries as well as additional reports and assessments through the U.S. Drought Portal Reports web page at Drought.gov. According to the October 9 U.S. Drought Monitor, moderate to exceptional drought covers 22.3% of the United States. The November 22–30, 1950, Great Appalachian snowstorm ranked as a Category 5 event for the Ohio Valley on the Regional Snowfall Index. According to the October 23 U.S. Drought Monitor, moderate to exceptional drought covers 20.4% of the United States.